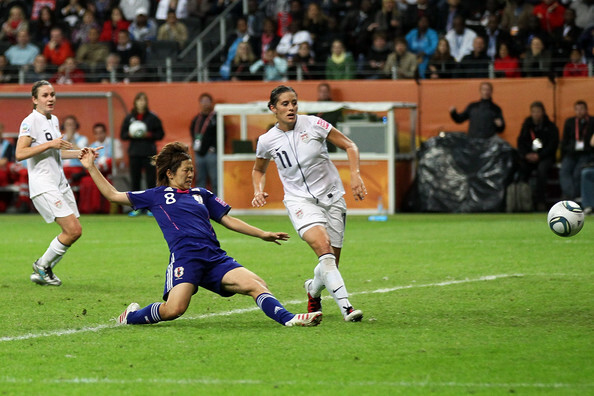 I watched a riveting Women’s World Cup Final on Sunday between the US and Japan. I would have preferred a different outcome, and I thought the US team dominated most of the match with ball possession and excellent shots on goal. However, congratulations need to go out to a Japanese team that maintained poise and patience and were incredibly opportunitistic with equalizer goals! I wrote a post on scoring soccer goals, and the US had ample opportunity because they followed that script perfectly. They just lacked accuracy. I can think of at least three shots on goal yesterday that were a ball diameter away from going in the net. My focus in this post is on the significant defensive breakdown that allowed Japan to score its first equalizer goals. Let’s review some soccer defense fundamentals and draw an analogy with our social media strategy. Talk! – Listen in on any team sport, and you will be amazed at the chatter and communication that goes on. In fact, a lot of the yelling I hear from coaches is because their players are not communicating enough out on the field/court. In this case, the US had stopped the attack. If the goalie wasn’t comfortable getting to the ball in time, then the defenders should have been listening to the goalie on where to clear the ball or tap the ball back to her. In social media, customers and prospects are talking about you regardless of whether you are part of the discussion or not. You need to find these “attacks”, which might even be overwhelmingly positive, and join the conversation! Give a hearty thank you for the praises and give a sincere apology with an offer to make things better if you are dealing with a disgruntled customer. Doing nothing, especially with negative feedback, can be disastrous and cost you the game as the feedback and your competitors score a hit against your brand. Clear the Penalty Box! – World class players have the ability to clear the box and send the ball halfway down the field. At the less competitive levels I always taught to clear to the sides in case a 2nd wave of offensive players are coming to tap in a rebound goal. Don’t try to dribble it out. Control it and then clear it. In social media, you want to take control of the situation before it escalates and potentially goes viral. If you have a bad review on Yelp or Amazon, or someone tweets a bad customer experience or posts a summary of the bad experience on their Facebook wall or YouTube channel, take the initiative. Control It (take ownership of the bad experience without getting overly defensive) and Clear It (turn that relationship around with a strong customer focus regardless of “fault”). Try to encourage closure that includes the consumer stating the problem was addressed to their satisfaction. Since the Internet never forgets, future consumers can see how you owned the situation and retained customer loyalty through great customer service. Reset the Defense! – If you can’t clear the box cleanly and start an attack in the other direction, then kick the ball out of bounds. Try to get out of bounds on the sideline, but concede the corner kick by kicking over the endline if that is the safest play. Do what it takes to give your team a chance to reset the defense. In social media, this means move past trying to determine fault or point fingers (even internally). While you are chattering at a customer trying to find them guilty of “user error”, or you are ignoring the negative reviews with the hope it will just go away, that 2nd wave of consumers is coming along to renew the attack. That opens up too many angles and opposing teamwork to score against your brand’s good reputation. Deal with the problem at hand by “conceding the corner”. Acknowledge the threat, quickly open the dialogue with the customer, and reset your defense by bringing the right resources to bear to address the customer issue. Of course, this type of defense is enhanced with a social media monitoring tool. You can identify trending issues and respond to customers in their chosen venue (Amazon review, Facebook Wall, YouTube channel, Twitter stream). Take a look at Mantis Pulse Analytics if you want to take proactive to the next level! It was a fantastic and classic game between the US and Japan. I loved the US attacking style, and I appreciated the perseverance of the Japanese team. I also enjoyed refreshing and outstanding sportsmanship throughout the match. Congratulations to the Japanese team, and “we will get them next time” USA! To see the world through Brian’s eyes….I’m always amazed at your analogies. Thanks, Cheri. Got a pastor, when he stumbles over some words or getting across an idea, says “I played football and drool a lot”. I probably look at the world a little sideways (and sports oriented) from getting hit in the head playing football…and getting dropped on my head in judo :).